Virgin Galactic's latest plane/rocket, dubbed "SpaceShipTwo", crashed after takeoff this morning above the Mojave Air and Space Port in California. Director Stu Witt told Bakersfield, California's KGET that the plane crashed east of Mojave. 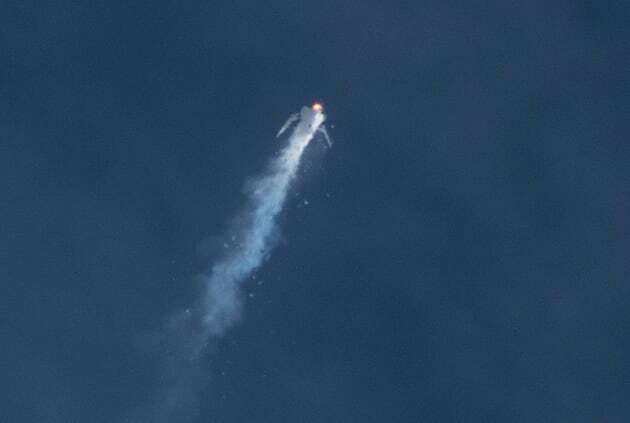 Two pilots helmed SpaceShipTwo, and their condition is still unknown; KGET reports that one fatality was mentioned in police and fire rescue scanner calls, while one parachute was reportedly spotted post-crash. Associated Press is reporting "one fatality, one major injury" from the crash, citing the California Highway Patrol. "Virgin Galactic's partner Scaled Composites conducted a powered test flight of SpaceShipTwo earlier today. During the test, the vehicle suffered a serious anomaly resulting in the loss of the vehicle. The WhiteKnightTwo carrier aircraft landed safely. Our first concern is the status of the pilots, which is unknown at this time. We will work closely with relevant authorities to determine the cause of this accident and provide updates as soon as we are able to do so." Virgin Galactic's SpaceShipTwo is an eight-person plane/spaceship combination. This morning's flight in Mojave, California was a test conducted by Virgin Galactic's partner Scaled Composites. It took off from a runway at the Mojave Air and Space Port just after 9AM PT, slung beneath its plane component ("WhiteKnightTwo"). 45 minutes later, it reached 50,000 feet and the rocket component (SpaceShipTwo) was freed for solo flight. Virgin Galactic reported an "anomaly" with the ship soon after, via Twitter. This isn't SpaceShipTwo's first test flight -- a successful test flight was completed last summer. The ship even has a lengthy list of passengers waiting to ride to sub-orbital flight, including Virgin owner Richard Branson. It's been a bad week for space flight, as Orbital Science's unmanned "Antares" aircraft exploded at launch on Tuesday. We'll keep updating this post as we learn more. Update 4: The Federal Aviation Administration says it's investigating the crash.